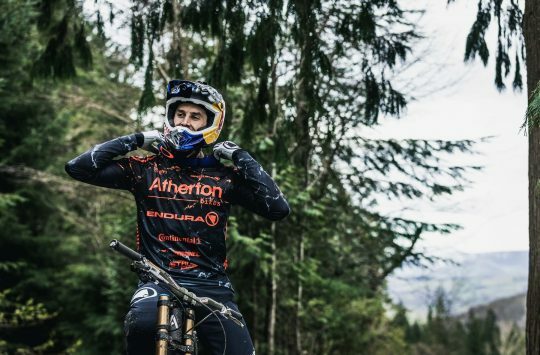 Scottish apparel brand Endura is likely better known for its line of indestructible baggy shorts and filthy wet weather riding gear, but the company has been steadily expanding its range over the years to include other types of products including protective wear and helmets. One of those products is the SingleTrack Knee Protector (we’ll call it a knee pad like everyone else does). 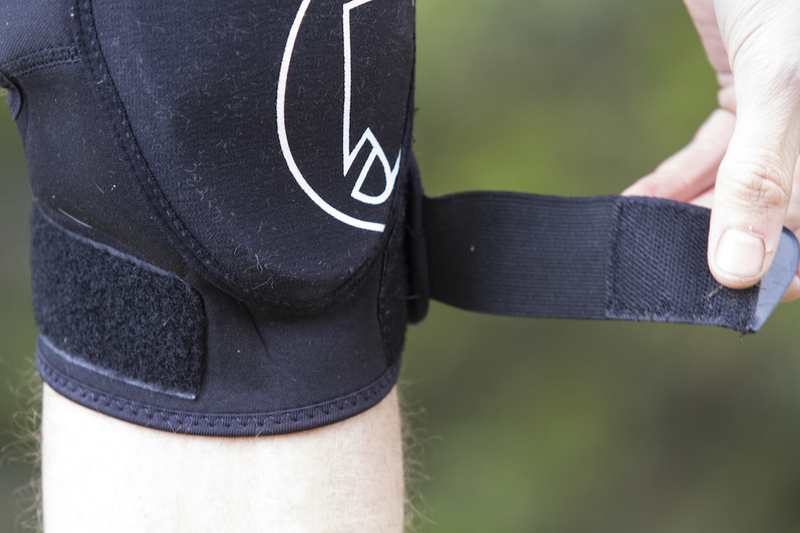 Also available in an elbow version, the SingleTrack knee pad is a soft-shell pad that features a fully open design with dual velcro straps to secure it down and around your knees. It’s only available in two sizes; Small/Medium (tested) and Large/X-Large. Endura SingleTrack Knee Protectors (aka; knee pads). Some of you may have seen that Endura introduced another knee pad to its protective wear range, called the MTR Knee Guard. 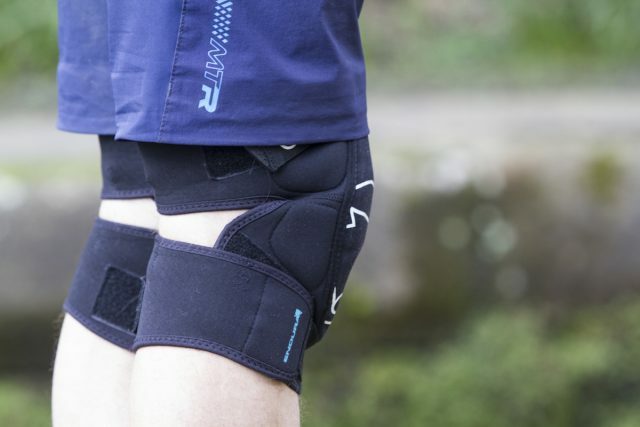 First spotted by us at the Eurobike show last year, the MTR is a slimmer option that makes use of Koroyd technology to create a knee pad that’s better ventilated and lighter weight. Unfortunately we couldn’t get the MTR knee pads in time for our ‘Pads For Pedalling’ group test, so I’ve been testing the SingleTrack knee pads instead. However, we’ll have a set of MTR knee pads in as soon as they’re available, so look out for a follow-up review in the near future. 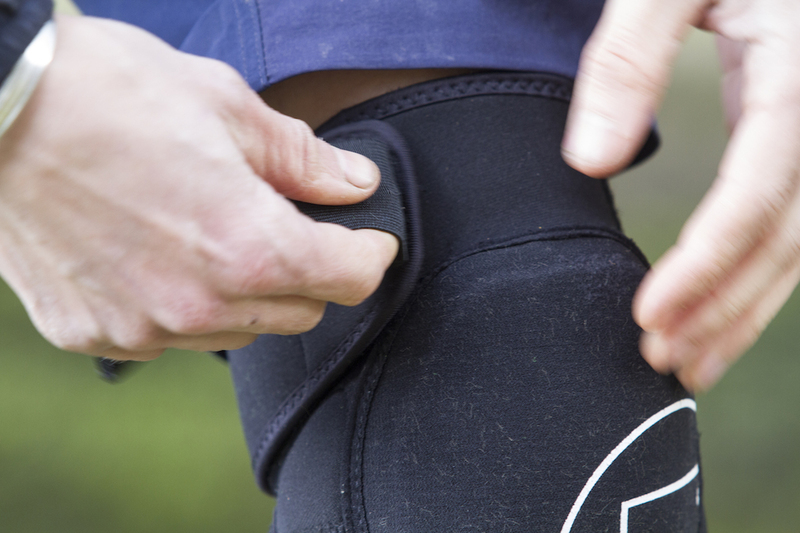 The SingleTrack is a softshell knee pad that’s designed to articulate and flex with your knee joint. The SingleTrack pads are built with a thick neoprene construction. Compared to all the other knee pads in the group test, the Endura SingleTrack knee pads are the only ones that feature a fully open design. That means they can be installed and removed all without having to take your shoes off. This is a design that we’re seeing less of these days, as most companies move towards a sleeve-type construction for their lightweight knee pad products. 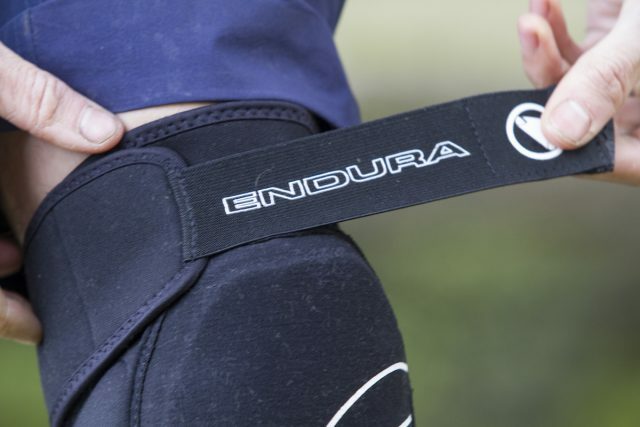 Indeed Endura’s new MTR knee pad will feature a complete sleeve construction. 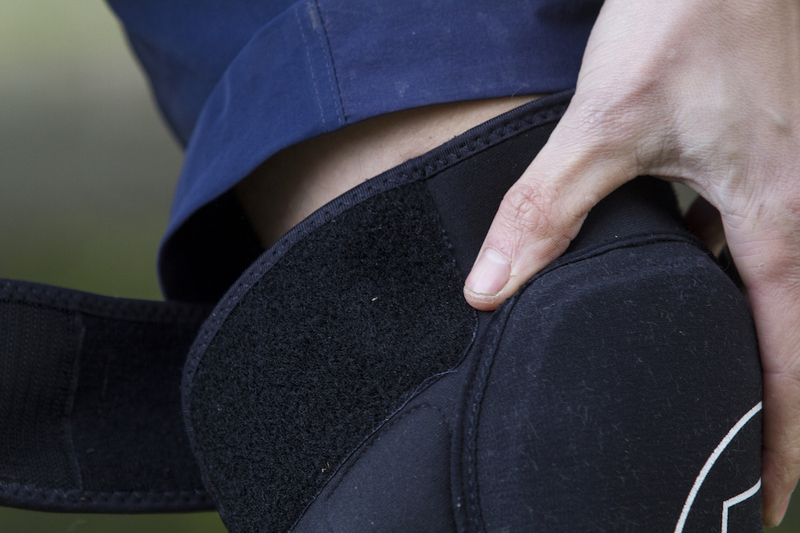 Two large profile elasticated velcro straps secure each pad to your knee. The advantage of the open design is that it’s quite easy to whip the SingleTrack knee pads on and off. Theres’ a large velcro strap at the top and bottom of the pad, and each strap is elasticated so you can reef it up to get them nice and snug. The top strap is offset away from the bike, so the strap won’t catch the frame’s top tube during pedalling. However, the lower strap is offset the other way for some reason unbeknownst to us, and the small rubber tab at the end of the strap did catch occasionally, which was quite annoying. The open design means the pads can be installed and removed without need for taking off your shoes. Whereas other knee pads in our group test have made use of Lycra and perforated mesh fabrics, the SingleTrack pads use a much thicker (but still stretchy) neoprene construction that offers a very snug and secure feel when on. However, it does mean they won’t deliver the same level of breathability as some of the ultra-thin knee pads currently on the market, such as the 661 Recon pads or the Dainese Trailskin 2 pads (the latter of which one ‘Best Breathability’ in the magazine group test). The straps make the SingleTrack pads extremely secure. Hidden underneath the SingleTrack’s tough exterior is a soft memory foam pad that covers the knee cap. This oval-shaped panel is made up of a sandwich of multiple layers of soft memory foam, which allows it to flex and articulate as required around the knee during pedalling efforts. Although the pad feels soft to the touch, it’s over 10mm thick, offering plenty of cushioning for absorbing the various knocks and hits one could encounter when pushing their riding (and skill) limits. Endura has also added two aramid pads on each side of the knee, with the goal of protecting that boney tissue that often gets whacked by your handlebars or top tube during a high-speed trailside pile up. 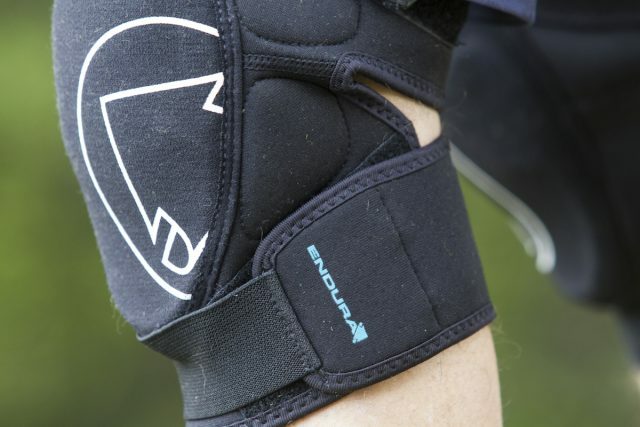 Compared to some of the other knee pads on test such as the Bluegrass Eagle Crossbill pads, the Endura SingleTracks certainly deliver much more coverage in this area. Underneath the fabric is a multi-layer soft memory foam pad for absorbing hits. The first thing you’ll notice when wearing the Endura SingleTrack knee pads is how warm they are. Likely because they’ve been designed and tested on faraway trails in Scotland, the SingleTrack pads make use of an insulating layer of Terry fabric on the inside of the pad. I can see this being useful for riding in really cold conditions, where you want your your knee to be kept warm and flexible, though you’d have to live in a pretty cold climate for most of the year round. Unfortunately the SingleTrack knee pads are far too warm for our liking. When wearing over the top of full bib tights on a near-zero degree ride, that’s not really a big deal. 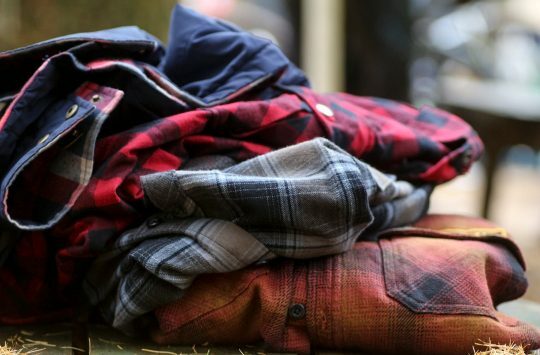 But when worn directly on bare skin on a long and arduous climb, that heat generates a lot of sweat. In my case, this sweat caused enough chafing that I actually bled real blood where the velcro straps contact the skin on the back of my knees. This was definitely more of an issue when the pads were new, and the abrasion settled down a little as the pads bedded in. Making use of chamois cream helped to mitigate some of the chafing (and is useful with any type of knee pad), but even still there was enough irritation with the SingleTrack knee pads that I began to avoid wearing them altogether for longer rides. Of course with the open design of the Endura SingleTrack pads, they’re quick and easy to whip off, and I’d recommend storing them in your backpack for the climbs, before putting them on at the start of a long descent. Problem is with our local winch ‘n’ plummet trails around Calder Valley, you’d be stopping every 10 minutes to take pads on and off that nobody in their right mind would ride with you. 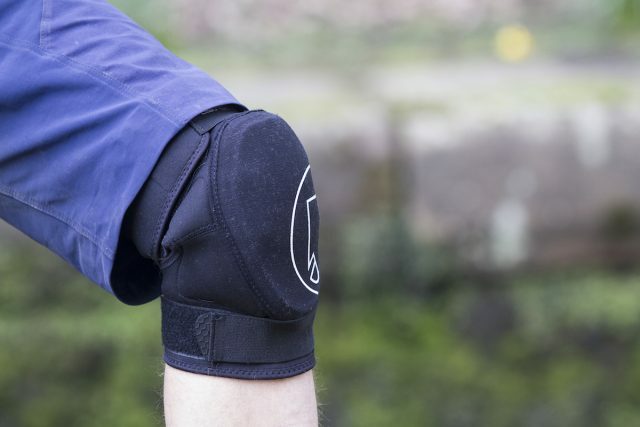 And ultimately in a ‘Pads For Pedalling’ group test, you want a set of knee pads that are comfortable enough to wear throughout the entire ride. As for actual protection though, the SingleTrack knee pads are very good, and were far better than the majority of super slim pads that they were tested against. That thick and soft memory foam sandwich proved effective at copping direct rock strikes, and the secure strap system meant there was very little movement in the pads when taking a digger off the edge of the trail. For hard-hitting trail riders and enduro racers, that flexible protection will be welcome on trails that offer little margin for error. Unless you ride in colder climates, the SingleTrack knee pads result in a lot of sweat and chafing. The Endura SingleTrack knee pads offer a snug and secure design that you can install and remove without having to worry about taking your shoes off. And if your ride profile typically looks like one giant triangle, then being able to easily whip these off for the long climb to stow in your backpack before strapping them on for the way down will be appealing. Relative to the other lightweight pads in our group test, the SingleTrack knee pads proved much warmer to wear in our experience. For long pedally rides, this resulted in more sweat and chafing, which led to significant comfort issues that marked them down against some of the much lighter and more breathable pads on test. 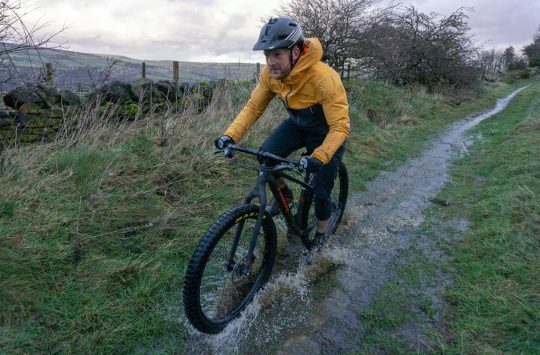 For riders who dwell in colder conditions, that won’t be so much of an issue, and the insulating properties of the SingleTrack pads may in fact be a plus for below-zero temperatures. 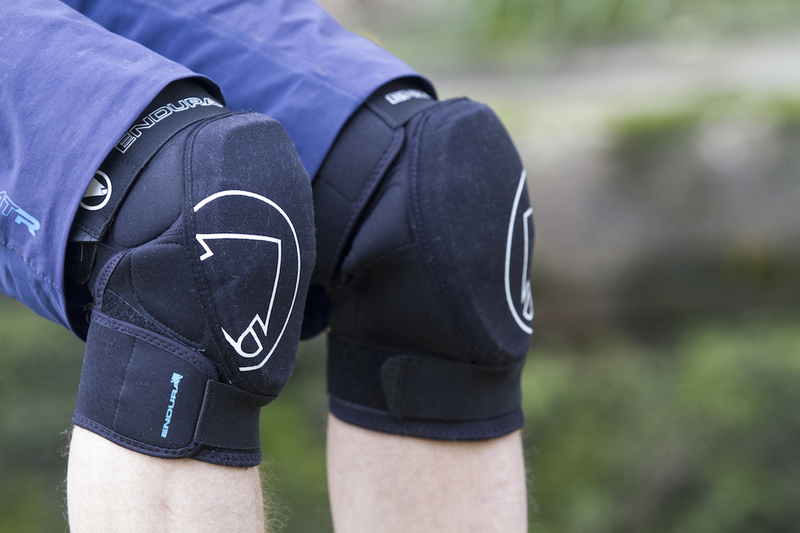 However, for our typical British trail riding conditions, we’re keen to try out the new MTR knee pads to see how they compare when it comes to ventilation and flexibility. I’ve previously​ had fox launch pros and I’d say the single-tracks are not as hot as them, with a better fit, more adjustability and easier to take on/off.